This whole is thing is stupid. I can see the light at the end of the tunnel. I know it's there. I know it's real. But I've stopped moving towards it. I'm no longer putting one foot in front of the other. And why? Because... it's too dark, I guess? I mean, come on, you could stub your damn toes walking around in the dark! So instead I'll just sit down here and bash my head against the tunnel wall for a while. 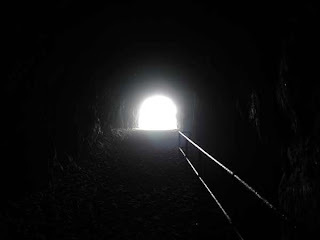 Of all the lights at the ends of tunnels that Google images returns, I like this one. Okay wait, what does this metaphor even mean? What it means is, because I haven't been taking any actual steps toward transition or even making any effort to express my gender, I feel depressed. And because I feel depressed, I lack the motivation to take those steps or make that effort. And I am just barely restraining myself from actually bashing my head against a wall— that part's nearly not a metaphor. I can relate. I've often used this metaphor. Yeah. As a metaphor it might be slightly cliché, but if it helps us put our experiences into words, then it helps. Also, don't bang your head on the wall. It really hurts. I'm sorry, hon. I know exactly how you feel right now. Unfortunately. Those of us in this little community need to be extra strong, given the challenges we face. Those who are not part of it can't understand (even when they want to do so). That's why we need each other. I suspect you have hidden reserves of strength you don't even know exist yet. And how do you tap into it, you ask? Simple. In the morning, pick just one thing - one tiny thing - that will take you one tiny step closer to transitioning/expressing your gender. Read an article, shop online for clothes, talk with a friend about how you're feeling, do your nails... it doesn't really matter what it is. It just matters that you do it. And make it really, really small. So you won't feel overwhelmed. And then do it all over again the next day. And the next. And the next. Just one tiny thing. And before you know it, you've done a bunch of tiny things... and put together, they aren't so tiny. It works. Trust me. I know. :) And if I can do it, and do it when I am feeling at my lowest, as I am now, then you can too. I have faith in you. So... one tiny step. Starting tomorrow. For yourself. Because you are worth it. I think even just forcing myself to shave my face every day would go a long way. I had been feeling pretty low all week and kept putting it off and by the time I wrote this post I was looking pretty stubbly, bleck. I just hate shaving so much. I just made up my mind that I will go clothes shopping this weekend. It's been a while, and now that the weather's getting colder I need some more sweaters anyways. I have been feeling very blue lately myself. It's been a very hard few weeks. But I am forcing myself to do things I know are good for me - running, working on makeup, seeing friends - even though I would prefer to simply crawl into bed. But he did that; I know I can't. I still feel awful, but action is better than inaction. So good for you for taking these steps. And I totally understand about shaving. Are you considering laser/electrolysis? I've been going for two years, and we have made a huge amount of progress considering where I was when I started. (I could grow a full beard in ten days.) I have a long way to go (and we haven't even started on the work needed for GCS), but we are now much closer to the finish line than the starting line. My electrologist had never worked with a trans client before me, nor, to her knowledge, had she ever met anyone who was trans. But the first thing she said upon meeting me as she looked at my face was telling: "Shaving is painful for you, isn't it?" I said, "Yes, it is." And she thought for a moment and said, "And it's not just physical pain, is it?" Quite perceptive for someone totally new to this world. I'm fortunate; both she and the woman filling in for her while she recovers from knee surgery are almost like therapists. You spend so much time together you almost inevitably develop a close relationship. I am grateful I've met them both. Also... I did not get around to clothes shopping this weekend like I said I would. Ah well... next weekend! It's perfectly natural to be afraid, Ashley. It's an unknown. I won't lie; it isn't pleasant. But you can mitigate the effects. An hour before your session, apply plenty of Lidocaine and take ibuprofen. After the session, ice it down to reduce the swelling and redness. One trick a friend suggested that really works: Take a paper towel and fold it into quarters. Soak it in water, place it in a Ziploc sandwich bag, and put it in the freezer. When you come home, just apply it to your face. It really works. You are very welcome, Ashley. And thank you for your kind words yesterday. As you said, it means a lot. Thank you, hon.